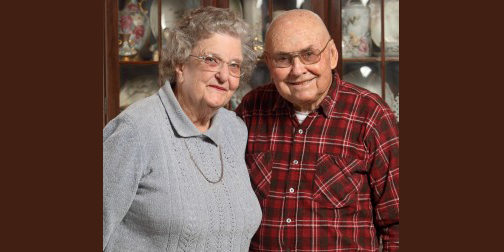 Wandalee '54 and John Fullerton have committed their lives to serving others. As a social worker and firefighter, they assisted Ventura County residents throughout their long careers - and the scholarship fund they created for Westmont students will endure for generations, helping many. A sociology major at Westmont, Wandalee became a social worker after she graduated. Through the Ventura County Welfare Department, she worked with seniors, family services, licensed day care businesses and foster homes. John grew up in Ventura and got his first job in Shell Oil's drilling department. After three years in the Army during the Korean War, he turned to firefighting. Thanks to his experience with the oil industry, he developed an expertise in oil fires. As a Ventura County firefighter, he helped out with the 1964 Coyote Fire in Montecito, which destroyed Westmont's Catherwood Hall and burned around the edge of campus. He vividly recalls the blaze. Wandalee and John met at Ventura First Baptist Church, and Westmont instructor Howard Cleveland married them in his home. When the couple retired in 1987, they moved to Paso Robles, California, and bought a 23-acre farm with a walnut orchard. Wandalee's mother taught her to be frugal and to trust God to provide. "You have to be fiscally responsible," she says. "I learned a lot from elderly clients who out-lived their resources. It's important to plan for retirement. We saved and invested so we could retire." The Fullertons created the John R. and Wandalee A. Fullerton Endowed Scholarship to help Westmont students, and they add to it each month. "The best investment is in human beings who in turn can invest in others," Wandalee says. "We like the idea that our own scholarship recipients could one day invest in scholarships to help a future generation. We have what we need and prefer to invest in others." The couple is planning to provide a significant additional gift to their scholarship through a provision in their living trust. "Westmont's Gift Planning staff helped us make the arrangements," John says. "It was just the encouragement we needed to develop our estate plan the way we wanted it." Reproduced with permission from the winter 2011 Westmont College Magazine. For more information about how to create an endowed scholarship through your estate plan, please contact the Office of Gift Planning at (805) 565-6058 or giftplanning@westmont.edu.